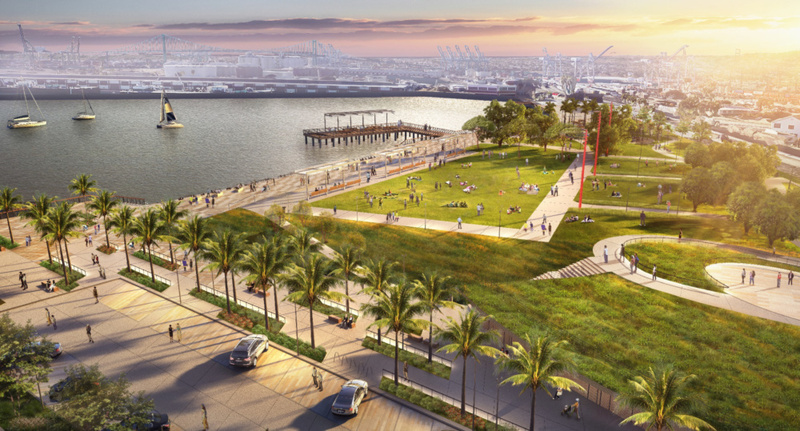 Designs for a transformative make-over of the Wilmington waterfront at the Port of Los Angeles are steadily moving forward as new renderings for the project offer a glimpse of what will soon be two of L.A.’s newest public spaces. Renderings unveiled by the Port of Los Angeles showcase views of the Avalon Promenade and Gateway and the Wilmington Waterfront Promenade projects, two new open spaces designed by T.Y. Lin International and Boston-based Sasaki, respectively, on adjacent sites in conjunction with the Wilmington Waterfront Masterplan project. L.A.-based landscape architects Studio MLA is assisting with the design of the Wilmington Waterfront Promenade project. The two public spaces will cap off an L-shaped spine of new open space and future commercial development envisioned by the master plan for the formerly-industrial areas that ring the port. The nine-block plan area includes the 30-acre Wilmington Waterfront Park, also designed by Sasaki, which opened in 2011. For T.Y. Lin International’s Avalon Promenade and Gateway component, plans call for vacating sections of three streets and removing a pair of storage tanks to create a large landscaped open space that will connect the city’s urban fabric with the Wilmington Waterfront to the south. The 13-acre site will contain a public plaza at its northernmost point and will be traversed by a sculptural promenade that runs to the waterfront. 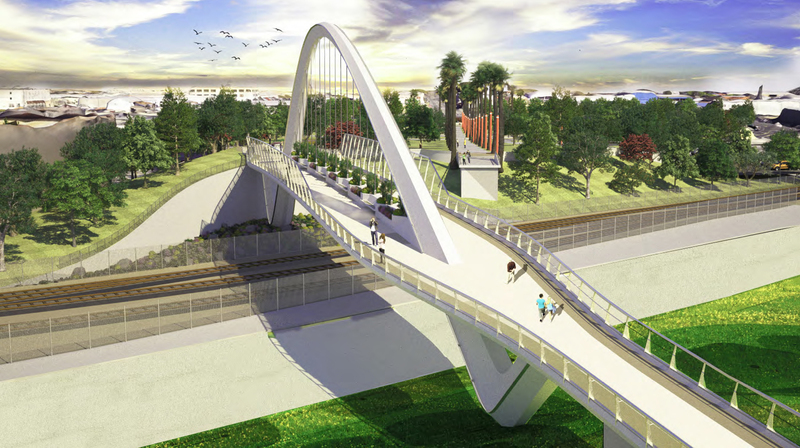 The project would involve constructing a new bridge over an existing depressed rail yard, with renderings showing a new cable-stayed pedestrian bridge crossing the gap. The nine-acre Wilmington Waterfront project will be located at the end of this path abutting the harbor. Here, Sasaki and Studio MLA are working to craft an interconnected series of plazas, piers, and restaurants, including a four-acre event space and playground, according to Curbed. A below-grade section of the park will contain a cluster of accessible bathroom facilities. Renderings for these areas showcase a central lawn and plaza fronting the ocean, with active uses located at the site’s corners. The central plaza area gives way to rough-hewn boulders that step into the water, according to the renderings. The developments join a cluster of recently-announced waterfront redevelopment efforts, including the Altasea development by Gensler. Both projects are well into design and are expected to break ground later this year, in anticipation of a 2019 opening.